The Golem haunts Old Prague in the 1967 French television adaptation of Gustav Meyrink’s famous novel. 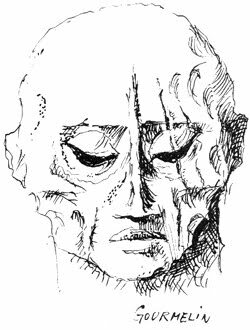 The Golem’s mask was designed by artist Jean Gourmelin, who passed away on October 9. He was 91. Virtually unknown in America, Gourmelin was a celebrated in his native France for his unique jet-black humorous cartoons and meticulous illustrations in a surrealist vein. As a young man, Gourmelin apprenticed with stained-glass master Max Ingrand and worked in the field for over twenty years before choosing to devote himself exclusively to illustration, coming to prominence in the early sixties as a regular contributor to the legendary Fortean magazine, Planète. Gourmelin published several collections of his drawings and illustrated books by such authors as Gaston Leroux, Guy de Maupassant and H.P.Lovecraft. In 1966, Gourmelin designed the elaborate, caligaresque sets for the ORTF’s telefilm of Gustav Meyrink’s Le Golem, directed by Jean Kerchbron from a script by Louis Pauwels, author of The Morning of the Magicians. 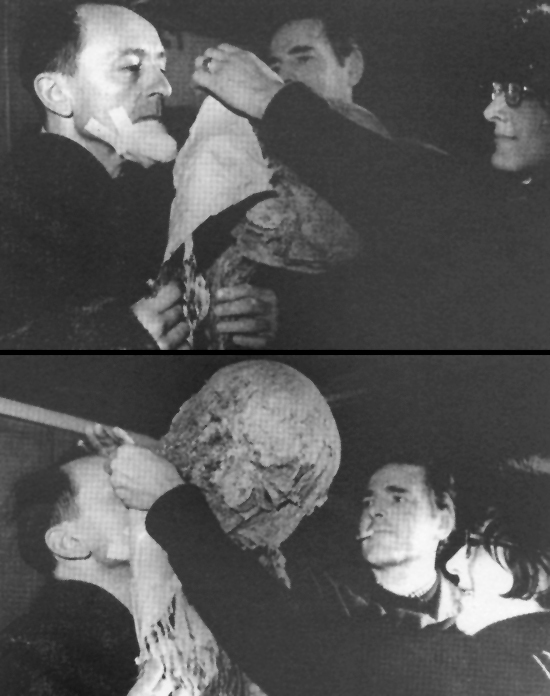 Gourmelin also created the Golem’s mask, closely based on Meyrink’s description of the creature with large, slanted eyes. In the photographs here, that’s Gourmelin — center — helping actor André Reybaz, who also played the lead role of the gem-cutter, Athanase Pernath. 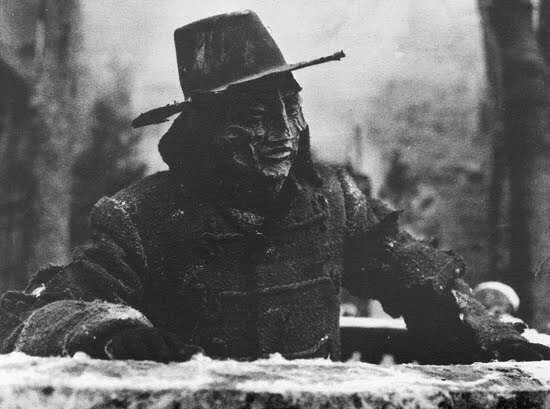 Le Golem was as a bold experiment in le fantastique, the producers giving veteran director Kerchbron and his team complete control over the project. 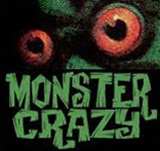 It is also remembered as one of the last French TV-movies made in black and white — which suited the film perfectly. Within a few months, the network had switched to full-time color broadcasting. Working with Kerchbron again, Gourmelin designed sets and costumes for the 1971 TV adaptation of Victor Hugo’s The Man Who Laughs. In 1977, he created the theatre sets for Andrée Chedid’s Nefertiti and he designed the poster for the original theatrical run of Les Misérables, directed by Robert Hossein. Sadly, over the last decade, Gourmelin suffered from failing health, but he lived long enough to see his work honored in major retrospectives at the Palais des Beaux-Arts in Brussels, the prestigious Centre-Pompidou in Paris and, just one month before his death, the city of Vendôme where stained-glass art created in his younger days adorn the chapels of two local castles. There’s a ten-minute excerpt of Le Golem — in French, and unfortunately sans title creature — on Ina.fr, where whole film can be downloaded for a very reasonable 4 Euros. Update: Here is a brief, 60-second montage where the Golem is glimpsed, pursued by an angry mob. Images from Midi-Minuit Fantastique No. 15-16, December 1966. Jean Gourmelin’s official website.A collection of drawings from Planète Magazine, on Art Maniac. The Fortean Times’ Secret of the Golem. 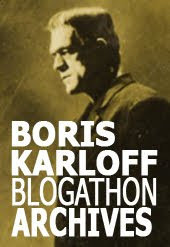 Ah, another informative and nicely still-ustrated post on Frankensteinia! I knew little of this Golem until now. Thanks for the rare pics and great text, Pierre. The face rather resembles the flayed face of an anatomy model, with sharp angles reminiscent of machinery. Like the original 1931 Pierce design of the Frankenstein, it subtly calls to mind both a corpse and something mechanical. It's a very beautiful design. Looks like Baron Blood! I wonder if they knew one another. Or was it mud brothers?